Full German texts provided. No English translations. Marking Valery Gergiev’s first season as music director of the Münchner Philharmoniker, this performance of Mahler’s Symphony No. 2 “Resurrection” is the first of a number of live recordings appearing on the orchestra’s own label. Last month I attended a performance of Mahler Symphony No. 4 by the Münchner Philharmoniker under Gergiev at the Philharmonie, Munich. I was delighted to hear this orchestra upholding its long Mahler tradition with such a magnificent performance. Mahler laboured long and hard between 1888 and 1894 on his Symphony No. 2, undertaking later revisions. Widely known as the “Resurrection” Symphony, this five-movement work is scored for soprano and contralto soloists, mixed chorus and orchestra. At that time Mahler was still carving out a name for himself as a conductor, normally composing the score in his spare time, mainly during his summer vacations. Some of the work was composed in a hut Mahler had built on a lakeside meadow in Steinbach overlooking Attersee (lake) in the spectacular Alpine and lakes region of Salzkammergut. In this substantial score, one of the greatest and most compelling creations of the Late-Romantic period, Mahler attempts to explore the existence of humanity in its entirety, using sung text in the final two movements. In the fourth movement the text is from the collection of German folk poetry known as Des Knaben Wunderhorn (The Youth’s Magic Horn). The fifth movement uses text from Friedrich Gottlieb Klopstock’s ode Die Auferstehung (The Resurrection) and then Mahler uses his own words beginning with O glaube, mein Herz (O believe, my heart). This Munich performance was recorded at a run of live performances at the Philharmonie. I have seen a live stream of one of those concerts, on 17th September 2015, broadcast on the 3sat television network. It is a quite stunning performance. It brings a lump to the throat and I do not think I have ever seen Gergiev as totally involved in a concert of any work. With the performance on this release, there is a palpable essential trust and empathy between Gergiev and his highly cultivated Münchner Philharmoniker. Right from the opening movement Allegro maestoso, the potency and bite of the Munich orchestra is striking. Maestro Gergiev adopts impressive pacing throughout, with beautiful playing especially in the more lyrical passages. All sections of the orchestra impress, but I find the stunning playing of the brass and woodwind especially committed, expressive and perfectly in unison. In Gergiev’s hands, the exquisitely scored second movement marked Andante moderato with its gentle Ländler feels so light on its feet and elegant, evoking a mid-nineteenth century dance hall in Vienna. As the music develops in weight and intensity, the sound produced is remarkable especially from the golden sheen of the Munich strings. Towards the conclusion of the movement, the whirling sound on the strings has a dizzying effect. Sounding like gunshots, the timpani strokes announce the opening of the third movement Scherzo. The swirling writing draws on the captivating melody from Mahler’s Wunderhorn song Des Antonius von Padua Fischpredigt (St. Anthony’s Sermon to the Fishes). Gergiev draws out the acerbic and bitter sarcasm in Mahler’s writing quite splendidly. In the section reminiscent of a klezmer band, the schmoozing clarinet solo always feels like a characteristic Mahler reference to Jewish folk music. The angry brass outburst at 8:01 is especially striking, as is the force of the pent-up energy released in Mahler’s terrible scream of anguish at 8:23, putting an immediate if temporary halt to the bucolic frolicking. Urlicht (Primeval Light) from one of Mahler’s own Wunderhorn songs is the title of the fourth movement. A genuine highlight is the performance of Olga Borodina, a rich and mellow-toned Russian mezzo-soprano, commencing with the words O Röschen Rot! (O red rose! ); a yearning declaration for respite from world weariness. Every word feels completely sincere, combined with her stunning expressive qualities and clear diction. Sounding totally controlled, Borodina displays her attractive timbre and flexible projection. Following on closely is the spiritually affecting chorale intoned commendably on the brass with woodwind playing of an elevated quality. The final movement Im Tempo des Scherzos opening with Mahler’s dreadful scream of anguish is given such remarkable weight. It maintains a harrowing quality before decaying into mere dust. In the “wilderness” section, the off-stage brass make a sure impression with the chorale tune of the Dies irae followed by blazing brass fanfares. Impressive are the great drum rolls at 9:10-9:27, shaking me right down to my boots. A distinct martial quality to the brass fanfares is interrupted only by tetchy woodwind and angry percussion. Off-stage brass lingers in a lament interspersed with a flurry of birdsong on the flute and piccolo. At 19:46 the Munich chorus enter with the words Aufersteh’n, ja aufersteh’n wirst du (Rise again, yes rise again you will) that feels so mellow and tender, conveying a captivating impact. The text O glaube, mein Herz (O believe, my heart) is sung at 24:25 to magical effect by Borodina with her secure technique and appealing tone. German soprano Anne Schwanewilms is in fine expressive form too, excelling with the text O glaube. Du wardst nicht umsonst geboren! (O believe, You were not born for nothing!). Schwanewilms and Borodina combine with the heavenly Munich chorus with the words O Schmerz! Du Alldurchdringer! (O suffering! All pervading or O all-piercing pain!). With singing of such striking quality from the impeccably matched soloists and exceptional chorus, one could be excused for thinking they had been transported to paradise. After the final chorus the closing section soon develops in sheer weight and tension with the massed forces, organ and percussion battery including bells, combining in a thunderous climax, the most awe-inspiring and overwhelming that I have heard on disc. Special praise is due the magnificent Philharmonischer Chor München, impeccably rehearsed by chorus master Andreas Herrmann. Recorded at live performances at Philharmonie, Munich, the sound quality is first-class, especially clear and detailed, with an exceptional balance between soloists, choral and orchestral forces. There is little extraneous noise and the applause has been taken out. Titled “I shall die in order to live”, the booklet essay written by Klaus Döge is both helpful and informative. Full German texts are provided but regrettably and surprisingly there are no English translations. 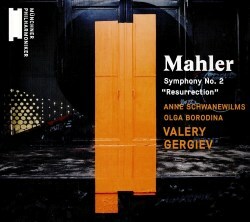 Mahler’s “Resurrection” Symphony has been recorded substantially over the years, with a number of fine recommendable accounts a list that now includes this Gergiev release with the Münchner Philharmoniker. First for its remarkable intensity and dramatic impact is the live 1995 Semperoper, Dresden performance with Bernard Haitink conducting Chor der Sächsischen Staatsoper Dresden, Sinfoniechor Dresden and Staatskapelle Dresden with soloists Charlotte Margiono (soprano) and Jard van Nes (mezzo-soprano) on Profil. For its great drama, there is the live 1989 Royal Festival Hall, London recording from London Philharmonic Orchestra and Choir under Klaus Tennstedt with soloists Yvonne Kenny (soprano) and Jard van Nes (mezzo-soprano) on the LPO own label. Making a considerable impression too is the live 1982 Herkulessaal, Munich recording from Symphonieorchester und Chor des Bayerischen Rundfunks with soloists Edith Mathis (soprano) and Brigitte Fassbaender (mezzo-soprano) conducted by Rafael Kublik on Audite. There is the inspiring 1986 studio account from City of Birmingham Symphony Orchestra and Chorus under Simon Rattle with soloists Arleen Auger (soprano) and Janet Baker (mezzo-soprano) on EMI. Significant praise is also due to Rattle’s insightful live 2006 recording with Rundfunkchor Berlin and Berliner Philharmoniker with soloists Kate Royal (soprano) and Magdalena Kožená (mezzo-soprano) on EMI. Leonard Bernstein was a great Mahlerian and I relish his intensely powerful 1963 Manhattan Center, New York account that he recorded with Collegiate Chorale and New York Philharmonic with soloists Lee Venora (soprano) and Jennie Tourel (mezzo-soprano) on Columbia (reissued by Sony). Valery Gergiev with the Münchner Philharmoniker underlines his credentials as a Mahlerian of some stature with this entirely compelling live account of the “Resurrection” Symphony.